A forgotten murder mystery in a small Germanic kingdom and a forgotten war between the U.S. and Mexico intersect to help bring one of the most accomplished military men in American history to prominence. That's the intriguing tale behind Ann Marie Ackermann's "Death of an Assassin," a short but gripping book mixing true crime with history. Ackermann writes about how a beloved mayor in a small town of what is now the German state of Baden-Württemberg was shot to death in 1835 in the dead of night. Eduard Hammer is the intrepid police magistrate assigned to the case. He gathers clues along the way of his investigation, extensively interviewing people who heard the shots and were near the location of the shooting at the time it took place. As this is happening, young Army officer Robert E. Lee struggles to balance his military career with the demands of his family. The murderer is on the loose and makes his way to America; as several residents of this small German town remain under suspicion of the yet-unsolved crime, Lee achieves successes in peacetime, such as his direction of the Army Corps of Engineers to open the river harbor in St. Louis. When war is declared against Mexico, Lee sees his chance to prove himself in battle . 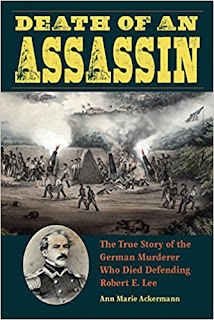 . . and so does the German murderer, now residing in Philadelphia's German-immigrant community. The murderer will serve in the U.S. Army and defend - and die defending - Lee's division at the siege of the Mexican city of Veracruz. "Death of an Assassin" brilliantly weaves two diametrically opposed tales with astonishing detail. Magistrate Hammer's investigation reads like a well-paced mystery novel, with dialogue taken from a nineteenth-century scribe's transcription of the interrogations along with minute descriptions of clues and ground-breaking forensic tests. Obscure moments in American history are seen through the eyes of a murder-immigrant directly and indirectly involved in them, and the reader learns a good deal about how America developed in the 1830s and 1840s. The siege of Veracruz is vividly brought to life, as is the heroism of the soldiers and sailors who fought there. In a letter home, Lee's poignant account of a man who died under heavy fire presents him as a multi-dimensional individual of honor and humanity. Little did Lee know that the man he eulogized was the man who shot a public official back in Germany. 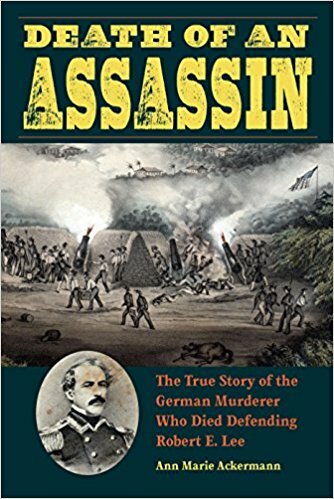 Ackermann brings everything full circle by showing how one of the longest cold cases in German history was solved by chance in 1872 - long after Lee's death, the end of the Civil War, and the unification of Germany - and how the assassin was proven to be the same man Lee praised in his correspondence. Without the verification of historical record, Ackermann's book could easily be fiction. The realization that it's all true is one of the many surprises and twists in a book that entertains as well as educates. Great review; can't wait to read it. Great review; can't wait to read this book!